Esa has served as the Ba’alat Tefillah since 2008. In her role as musical leader and shaliach tzibur she has been able to draw on her history at Temple Adath Yeshurun to maintain its musical traditions while at the same time, building new ones. Esa is a trained singer with a Master’s Degree in Voice Performance from Syracuse University. 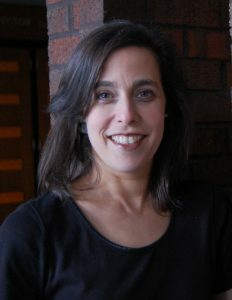 She also holds a Master’s Degree in Jewish Communal Service from the Hornstein Program at Brandeis University with a concentration in Jewish Education. Esa received her Bachelor’s Degree in Psychology from Brandeis University as well. Esa grew up at Temple Adath Yeshurun. She was active in USY and is a graduate of the Syracuse Hebrew Day School. She is also a graduate of the Epstein Hebrew High School. She began her professional life at Temple Adath Yeshurun after she returned to Syracuse with her husband. Esa first worked as a teacher in the religious school and as a youth advisor. She later became the Director of Education, a job she held for eight years. She transitioned to the job of Ba’alat Tefillah after that. Esa has sung with many groups in the community including Syracuse Opera, Syracuse Vocal Ensemble and Syracuse University Oratorio Society. Esa has taught at the Epstein Hebrew High School and has served on the Board of the Syracuse Hebrew Day School. Esa is married to Chaim Jaffe who has served as the President of Temple Adath Yeshurun. Esa and Chaim have four children; Ari, Shai, Ilana and Jonah.